In my previous post in this series, I introduced the idea of a derivative, and we realized a number of rules regarding them. In this post, we’re going to give some thought as to what derivatives are, look at them from from a rather different perspective, and realize several more rules regarding them. If Bob was to tell you that he traveled 100 meters in 2 minutes, you’d be able to tell me that, on average, he was moving at 50 meters a minute or about 0.83 meters a second. So walking speed. But he might have ran for the first 50 seconds at 2m/s and then stood still for the remainder! The derivative is different from the average rate in that it is instantaneous. It’s how fast Bob’s going at a give point in time! To get this we take the value we get as we shrink the range we’re averaging around. Now we traditionally represent change in a variable as . For example, change in distance is represented , change in time and so on. So average speed is . Since the derivative is the tiny instantaneous changes being divided, we write it as . A lot can be said about limits. They’re closely tied to the idea of continuity and are very important in analysis, which is the area of higher mathematics that is built around calculus, providing its foundations and extending it in many interesting ways. But I don’t think it makes sense to talk about limits at an introductory level. (In particular, I don’t think that it makes sense to talk about limits if you aren’t going to use the words `epsilon’ and `delta’.) So I’ll leave the topic here. Yay! And if we divide by , we get the derivative (instead of the differential), . 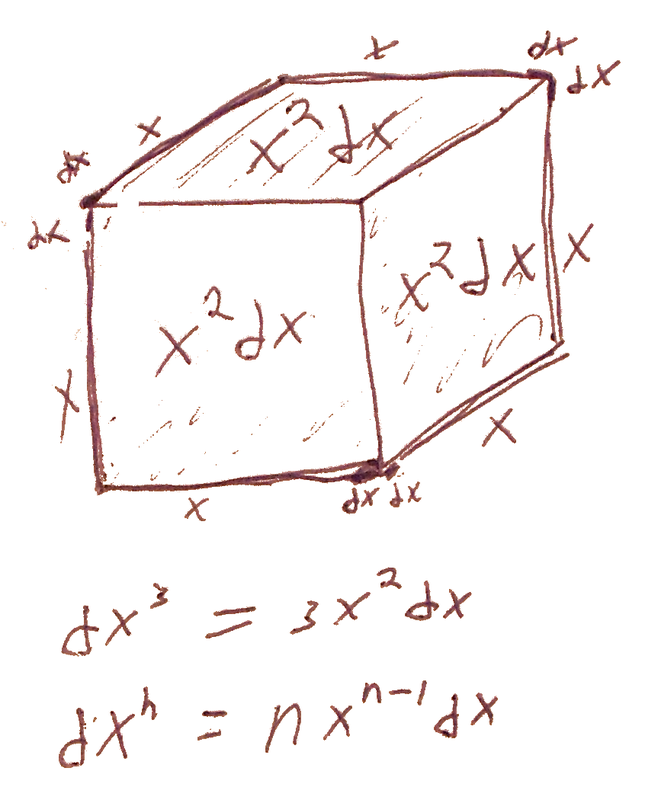 Now let’s get back to our “derivative rules” from the differential form perspective. 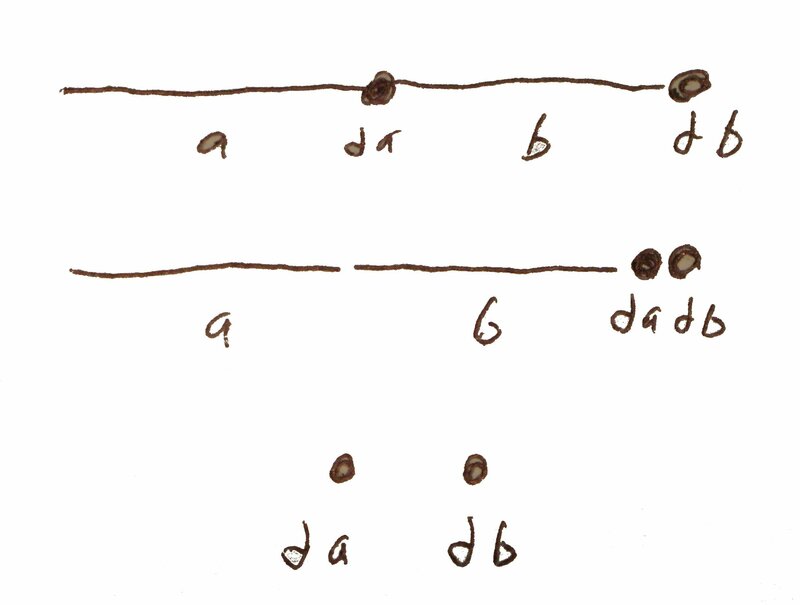 The little change in and is the sum of their changes, as seen by moving the dots. In general, you can visualize the differential of a function by imagine that function with the input pushed forward by a dot (representing the differential) and then subtracting the function without the dot. Now the final “traditional rule” is the fact that the derivative of is itself. Let’s step back for a second. Imagine a function that is 1 at 0 and is its own derivative. 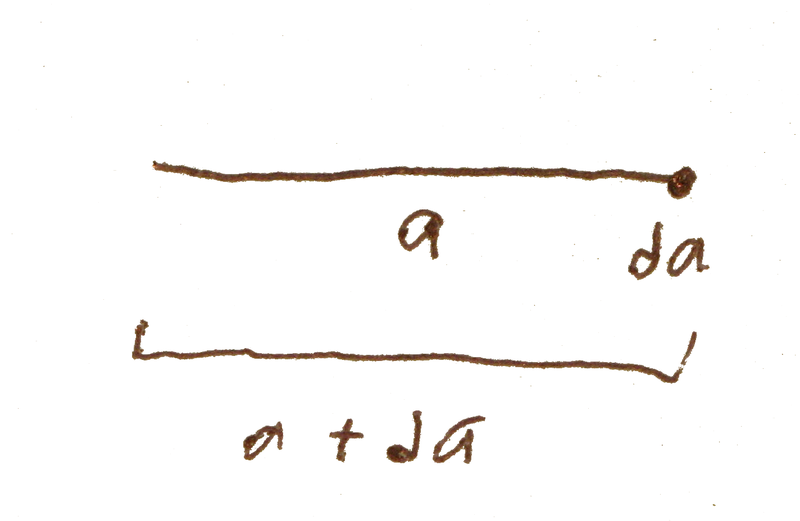 If you walk backwards, you approach but never touch 0, because the derivative goes to 0 as the function does. On the other hand, the function gets steeper and stepper going forward. If you know what looks like, you know it looks similar to this. And in fact, lets consider an intuitive example of something that decreases at a rate proportional to itself: the decay of radioactive elements. We all know that they have a half-life, a period of time in which half of the will decay. It is clear the derivative is a negative multiple of the present value, , since the number you loose is proportional to the number you have. And if you think about it in terms of half-life, you realize that half life is an exponential function, something of the form . But it is very difficult to see that the base of the exponential that is its own derivative is e. I recommend just accepting that as the definition of , or perhaps even the function . Still, if you want to convince yourself of it, consider as ; from here you can apply an argument similar to the one for power rule. And that’s it! We’re done with derivatives. That’s the content of half a course in Calculus, right there! Let’s do an example of it: calculate . Try and do it by yourself, with out looking at the solution! Feel free to look back at the rules. In the next post in this series, we’ll talk about doing the opposite of differentiation: integration. I’m really not happy with how I handled exponentials, but I think otherwise this post was pretty good. This entry was posted on August 11, 2011 at 04:33 and is filed under YAKC. You can follow any responses to this entry through the RSS 2.0 feed. You can leave a response, or trackback from your own site. +1 for using Δx instead of h. Makes much more sense. I’m interested in how you’re going to treat p-forms and (general) Stoke’s theorem. If you stick to R_3, things may be ok but how are you going to treat general calculus on manifolds? Great, we’ve independently thought up of the exact same way of showing the derivative of squares and cubes geometrically! For exponential functions, the definition of an exponential function is that f(x + k) = cf(x) – an additive increment in x causes a multiplicative increase in f(x). Consider multiplying rabbits: year 1, you have 100 rabbits. Year 2 (simplifying here and making rabbits immortal and instantly adult for the sake of example) each rabbit pair has 2 children (ie. 1 child per rabbit), so 100 rabbits get added and you have 200 rabbits. Year three, add 200, get 400. The pattern is that the rate of growth is clearly a multiple of the population itself (in our case 1x, for dogs we might make it 0.1x), and an increment of 1 year doubles the population (or, in dogs, increases it by 1.1x). That’s a really good explanation for the exponential function. I think I’ll update the post and add it when I have a bit more time.